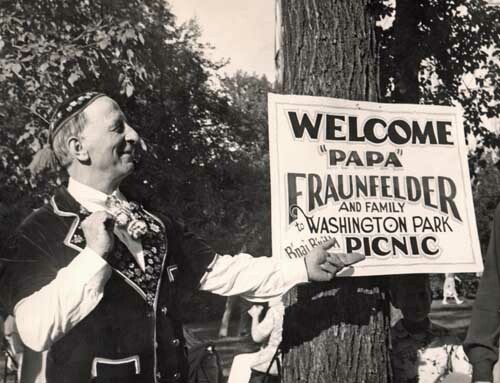 Papa is shown with this sign welcoming him to a picnic at Washington Park hosted by B'nai B'rith. This may have been taken in Portland, Ore. B'nai B'rith, an organization still very active today, often speaks for the Jewish community on humanitarian and human rights issues. It offen sponsors Jewish family community activities. The date of this photo has not been determined. 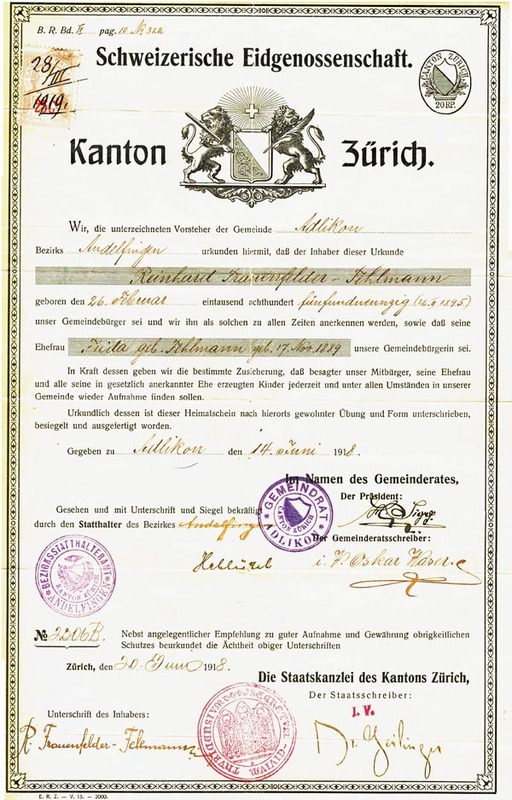 While Swiss Family Fraunfelder tunes were often traditional, many were arrangements by Papa Fraunfelder and some were original scores that he composed. 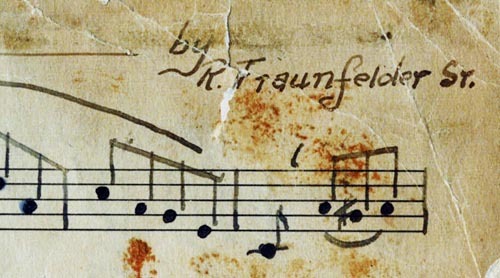 Right is handwritten sheet music of his "San Francisco Swiss March." On the back was his arrangement of the "Aelpler March," honoring the costumed autumn parade of Swiss bringing their cattle in from the high country pastures. 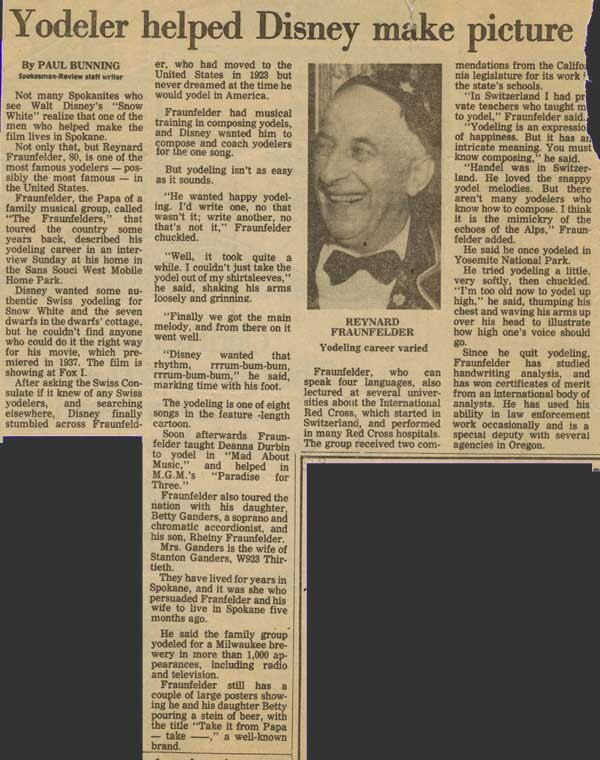 In his later years, Papa Fraunfelder worked in Portland, Ore. as a handwriting analyst. It seemed fitting because of his distinctive signature (right). 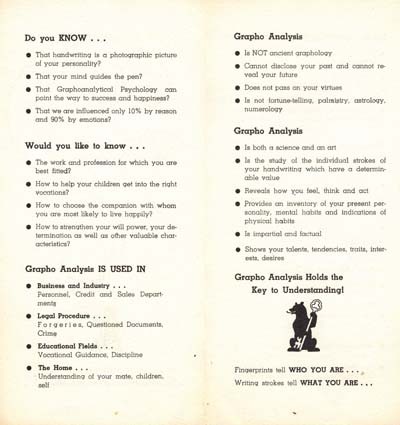 He subscribed to the teachings of the "International Grapho Analysis Society of Chicago, an organization that is still in existance today. It is a controversial teaching at best, teaching that changing someone's handwriting can change their personality. Nevertheless, his unusual occupation landed him a feature story in the Portland, Ore. Journal by Walli Schneider, headlined "Elfish-Eyed Handwriting Expert 'Cools' Reporter." 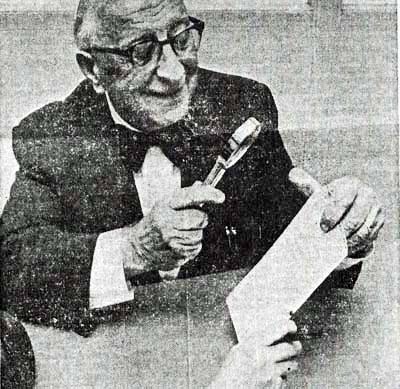 The caption under the above photo read, "Benign, whiskerless Santa is description of Portland handwriting expert R. Fraunfelder, Sr., interviewed by Journal Staff Writer Walli Schneider. Fraunfelder says handwriting analysis can be valuable discovery tool in personality study. At least 12 basic traits can be revealed through handwriting analysis."